It's been a while since I read such an intense book. 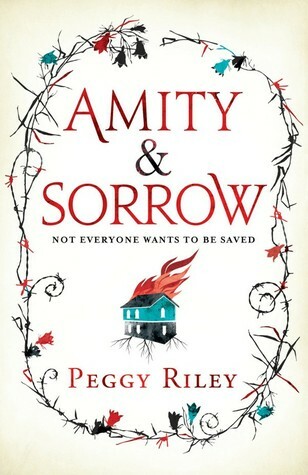 Not only does Amity and Sorrow have a very heavy subject matter, Riley's writing read like literary fiction. I had to use the dictionary feature on my Kindle several times, and that's unusual for me. Amity and Sorrow was a good book. It is very intelligently and emotionally written. I liked Riley's writing style and thought it suited the story very well. I loved the way Riley wrote the emotions of her characters. I loved Amaranth's strength and enjoy reading about a strong female lead, especially a mother. What kept me from loving this book though, was how sad it made me. There were definitely no happily-ever-afters, and while a traditional HEA would have made Amity and Sorrow feel unrealistic, I confess that I was still hoping for one. This book made me melancholy---in fact, I would not recommend reading it unless you are in a good place emotionally. I take things to heart, and reading about Amaranth, Amity and Sorrow's life really made me sad. That feeling of despair kept me from falling in love with the book. I would still recommend Amity and Sorrow and in fact, probably would have enjoyed it much more had I not been going through a tough time of illness at the time that I read it. Sounds very emotional and powerful!